A triptych mosaic looking at the flora and fauna around the Rhynes of Weston-super-Mare. When the artist was commissioned to represent the flora and fauna of Weston-super-Mare on a floor mosaic he was at first stumped. “I didn’t want to do simple botanical style illustrations on the floor, it seemed wrong”, Gary wanted to create something which would say more about the area. Walking around the area he discovered the network of waterways which drain the Somerset levels, known as the Rhynes. As he wandered around the area, criss-crossed by the Rhynes, the solution appeared, the floor could be the surface of the waterways and the flora and fauna the reflections in the waters surface. Gary has long had a fascination with the depiction of water in floor mosaics, but previous works had always been about the depth below the surface of the water. This time the water was to be used to portray the life that soared above the waters surface, so enabling the artist to show birds flying on the floor, through their reflections in the Rhynes. 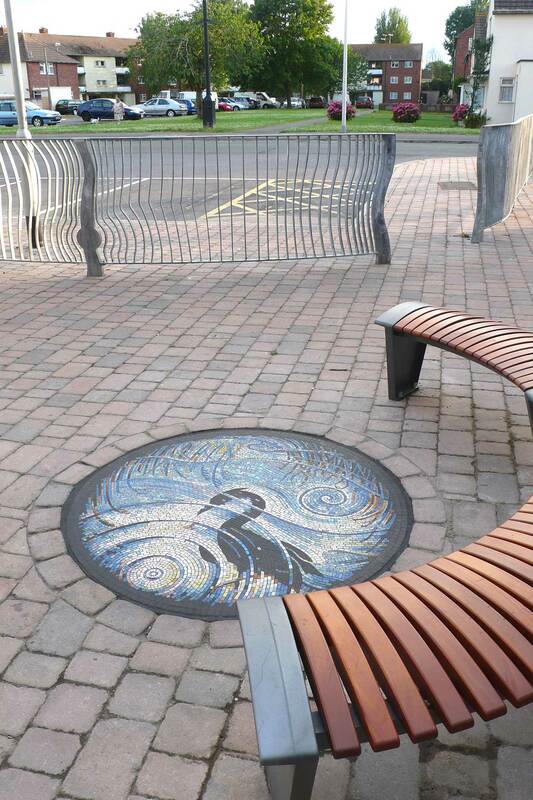 The final design for the work is a triptych of mosaics, a large central mosaic flanked by two smaller roundels co-ordinated in with the new seating and paving. In this image we see one of the smaller mosaics showing the reflection of a heron in the water, perhaps looking for some fish below. The mosaics were made using high fired unglazed ceramic, porcelain.